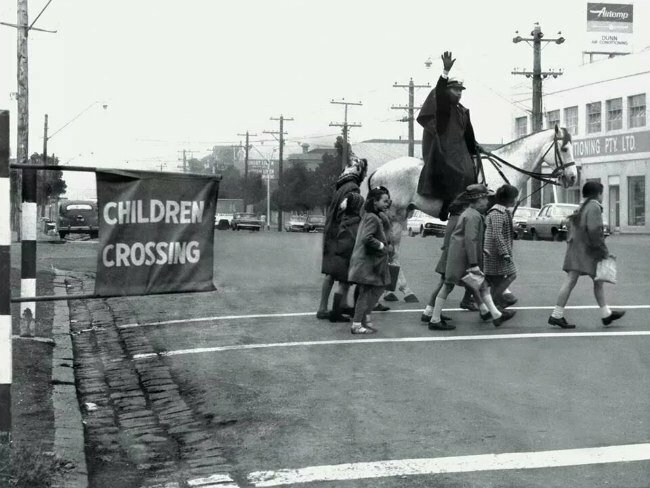 School Crossings were introduced in Victoria somewhere after World War II. The crossings were placed around schools on roads that pedestrians frequently crossed at school peak times. The crossings consisted of 2 large red and white posts that flags were placed in, and 2 smaller red and white posts and white lines painted on the road. They were not supervised. In 1973, the need for supervisors on these crossings became apparent when there was a spate of serious accidents at flagged crossings. There were fatalities that involved children; on both occasions they were double fatalities. In 1974 Rupert Hamer, Victoria’s then Premier. went on a fact finding mission to Britain to study school crossings. When he returned he went back to Parliament with the information and the Government then set a budget of 1 million dollars per year and decided to employ supervisors to manage the flagged crossings and pay them a wage. Once the wheels were set in motion it was decided that supervisors would be employed by the municipality at which the crossings were located. The training procedures were drafted and the uniform designed. The consultative committee consisted of representatives of the Roads Corporation, Victoria Police and Local Government. The original design of the uniform was to be a white coat with and orange “Sam Browne” sash and a peak cap similar to the Police. White was chosen in the beginning as in those days, the children were the ones encouraged to wear bright clothing, such as yellow. The orange sash and the hat gave the supervisor a feeling of authority and also good for visibility in all weather conditions. Originally the cost of the program would be a 50/50 split with the State and Local Council. The original uniform was in use until 2006. 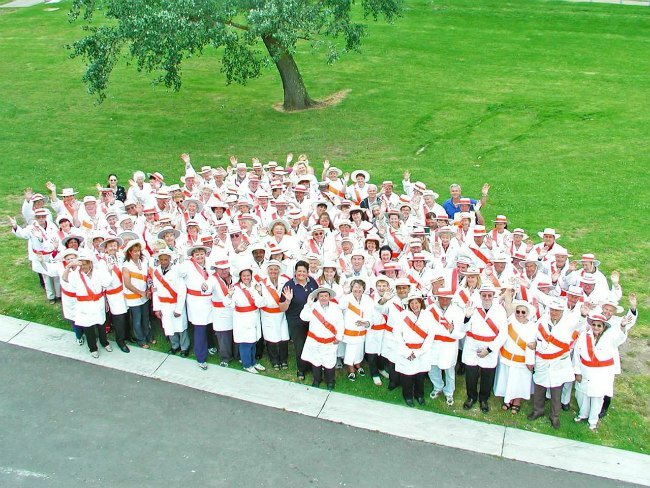 In July 2005, after two accidents in the Bendigo area involving School Crossing Supervisors, Worksafe Victoria declared that the white uniform with the orange sash was not visible enough and did not comply with Australian Standards. A working party was then established, as it was identified that School Crossing Supervisors hold an important place in the Community and needed to have their own identity. The unique “Sam Browne” style sash had to stay. The current uniform is a yellow vest with an orange “Sam Browne” sash. Reflective stripes are not compulsory as they do not work at night, however reflective is chosen for the wet weather coat. Crossing Supervisor is stencilled on the tail of the vest/jacket. There are approximately 79 municipalities in Victoria, and each Council is responsible for the children’s crossings located in their area. The numbers of crossings vary from Council to Council. Currently the Greater City of Geelong and the City of Casey have the largest amount of crossings in Victoria. Both have in excess of 190 crossing locations and in excess of 200 supervisors each. School Crossing Supervisors are effective at reducing crashes and injuries around a flagged crossing and they are recognised by the community. Most people refer to the School Crossing Supervisor affectionately as the “Lollypop People”. In Road Rules – Victoria they are referred to as “Children’s Crossing Supervisors”. Statistics show that supervised school crossings in Victoria have an excellent safety record. Most people are struck well away from a safety device (crossing). Some pedestrians are struck at signals when walking against a red traffic control signal, and some are struck from vehicles that are turning right.